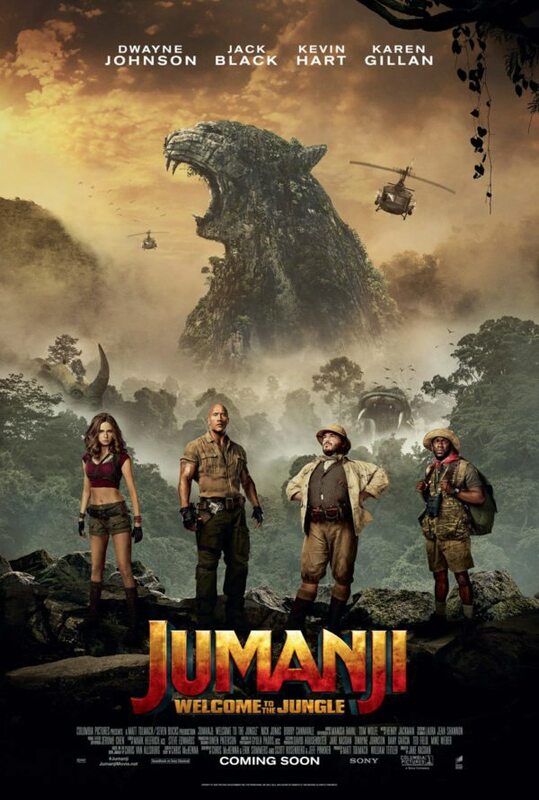 Posted on January 14, 2018 by Max U.
Jumanji was a excellent film about thinking who you really are. Without a doubt the movie is hilariously funny. The movie had jokes coming at you left and right. In Jumanji the game is no longer a board game. It has been adapted to a video game with the same world and rules as the board game but instead. The cool thing about the movie is that the four teenagers choose the characters that they are the exact opposite of in real life. This comes back to the theme of the movie which is thinking about who you really are. The main character in the movie was Dwayne “The Rock” Johnson. He played his role well as a Indiana Jones type character. He basically played the role he plays in most movies. The main two characters who stole the show were Kevin Hart and Jack Black. Kevin Hart was hilarious as Kevin Hart always is. I think this might have been one of his best performances. Jack Black played his character perfectly. He got the concept of a teenage girl trapped in a man’s body. I don’t think there could’ve been any one else to play his role better than Black did. Another character in the movie was played by Nick Jonas. This film may make him known to many filmmakers even though he was a last minute character. The movie was very good so directors might look at him a little closer. I definitely liked the movie. I thought it played out excellent. The movie was most definitely a action comedy. Almost every time Kevin Hart or Jack Black spoke it was a new joke. The movie also starts out with the four teenagers against each other. In my head I saw it like two of them hated each other and the other two hated each other. I loved this because this was a pathway to character development. Each and every main character in this movie received character development. My honest opinion is that the movie was great. It had the perfect combination of action and adventure. The acting was amazing in the movie also.